GIA Jewelry Career Fair is the gem and jewelry industry’s largest recruiting event. Whether you’re looking for a rewarding career or seeking to hire a qualified gem and jewelry professional, GIA Jewelry Career Fair is where opportunity happens. 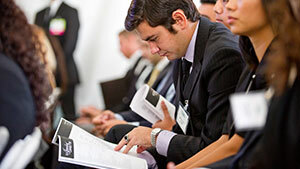 Get ready to “speed date” with dozens of employers looking to hire GIA graduates. Network with industry leaders. Have one-on-one coaching sessions with successful professionals in your field of interest. All this happens at GIA Jewelry Career Fair. It’s your chance to begin a rewarding career and create a bright future. It’s a day full of opportunities, and we hope you make the most of them. The gem and jewelry industry is filled with a dazzling variety of careers – and Career Coaching is your opportunity to find the one that excites you. You’ll have a one-on-one conversation with an industry professional who wants to help you find your way. Get ready to leave with invaluable insights and new perspectives. 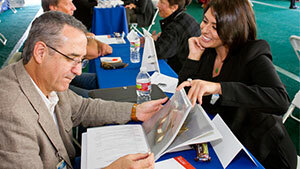 GIA Jewelry Career Fair is where career dreams become professional realities. You’ll find a diverse group of companies looking to hire. Expect to meet recruiters from iconic brands, top design houses, and innovative start-ups. Come prepared with your resume, your enthusiasm, and to have conversations that could lead to future opportunities. Looking to hire talented gem and jewelry professionals? GIA Jewelry Career Fair attracts hundreds of GIA graduates and industry professionals. 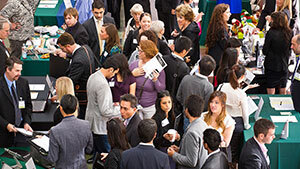 GIA Jewelry Career Fair is a must-attend event for companies in the gem and jewelry industry.